SCCA June Sprints and driving in the wet. This is one of our favorite weekends of the summer. 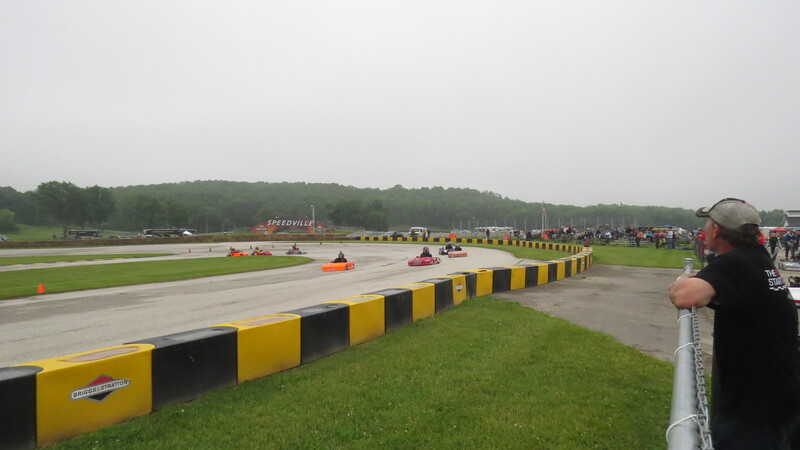 The SCCA June Sprints takes place at Road America and there is a Road America Kart Club race on Saturday night. The June Sprints is the Sports Car Club of America’s major race in the Midwest where amateur, semi-pro, and professional car racers compete in a verity of classes from near show room stock cars to purpose built race cars. The best thing about this weekend is I get hang out with my Dad and we have Jason as our guide in the pits, where he talks his way into cars. The weather on Saturday was a bit goofy – cloudy with alternating heavy fog and rain for most of the day. The three of us did manage to stay dry while we wandered around the pits and talked with drivers and crew. Jason, as always, was quite the charmer, talking his way in to a spec Mazda Miata, to the point of being strapped in with the 5 point harness. We also met some former CES racers, who were now racing a open wheel SCCA Formula car. 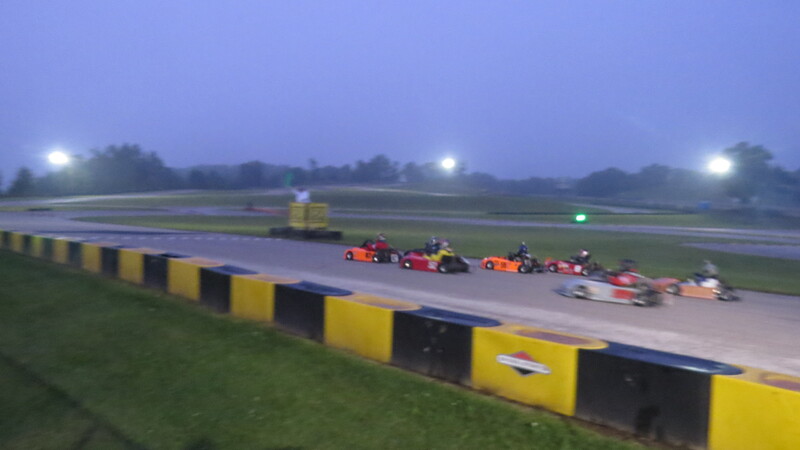 While we were chatting with drivers and crew, Jason was always sure to bring up the kart races and ask them to come out and watch and see what kart racing is all about. This is great way for him to learn to network and market himself. Practice for the evening was expected to start around 4:30, but instead, it rained for a bit and soaked the track. Once the rain stopped, we made the best of it by running practice laps on the wet track for about 45 minutes to help get it dry. Jason did a great job of keeping the kart under control and moving fast. Some of the older drivers did not demonstrate the same level of discipline. Once the track was dry there was one single practice session and then they were racing. Jason had a great start and was up to third, from 5th, by the first corner. By corner 4 he was in second and battling his friend Payton for first. 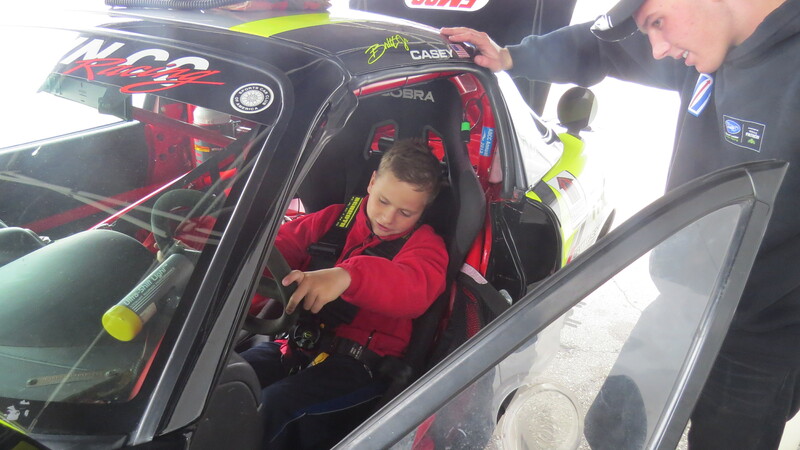 With one lap to go his kart seat came loose and he was forced to retire before the finish. I was able to quickly fix the problem but we were all a little aggravated by yet another mechanical problem. Heat 1, note the wet hot grid. After round one was complete it rained again, and again, Jason drove for 30-40 minutes to dry the track. He was having a blast exploring the changing track conditions as the track went from wet to dry, slick to sort of grippy. Once the track dried there was another quick practice and the second round of heats. Jason started in 3rd, but, at the start was forced to last when the kart in front of him had mechanical problems. Just up the hill, most of the field in front of him tangled and he dodged the melee, moving up into second. This time he was battling his friend Logan for first. It was a very close race but in the end there was not enough time to figure out how to get his kart out front, and he finished second again. Unfortunately, a few classes later, it rained again and the evening was called off. No features were run. It would have been great to see a race without incident between this set of drivers. Heat 2, camera filled and stopped recording. Sunday was spent watching the races on the big track. One of our friends has a Spec Racer Ford and had a great day of racing, he finished 3rd. Like us and every racer, he got bit by a change in the weather between practice and racing. His tires inflated too much for the now higher track temperature and prevented from driving all out due to lack of grip. In our wandering of the pits, we even met up with Adventure Aaron, while he was working on a June Sprints episode for MAVtv. This coming weekend we put all the practice and tuning from the last 2 months to work. It is the first race of the Briggs LO206 Cup at Badger Kart Club, where we will be fielding both the LO206 and the Animal karts. We will arrive on Friday for practice and more tuning and then two days of racing. The level of competition will be much higher with more experienced and better funded teams. This weekend’s racing is brought to you by T.J. Ross and Family, thank you for your support. After a few weeks of rest the next race will be at Grattan Raceway. This is a premier race track in Belding, MI, A drivers favorite. I need to thank my Dad without whom none of this will be possible. It was he who gave me my interest in motors and supported me as I tinkered with them when younger. Thank you, Karen. Some day when NASCAR Driver Jason buys you a house, you will thank me. Thanks to our 2015 sponsors for their continuing support: GoPro, Slick Products, Shorai, Amsoil, EVS, Stardust Memorials, The Greenwood Restaurant, C&M Auto Service, Atomic Decals, Danrr Autobody, T.J. Ross.